The first topic of the pre-meeting question period, of the Chicago Teachers House of Delegates on April 3, 2019, was the CTU’s donation to Toni Preckwinkle, who lost to Lori Lightfoot in the Chicago mayoral election runoff on April 2. A delegate asked President Jesse Sharkey who was that decided to give Toni Preckwinkle’s campaign more than $187,000, and was any of it given after the polls indicated she was far behind Lightfoot. 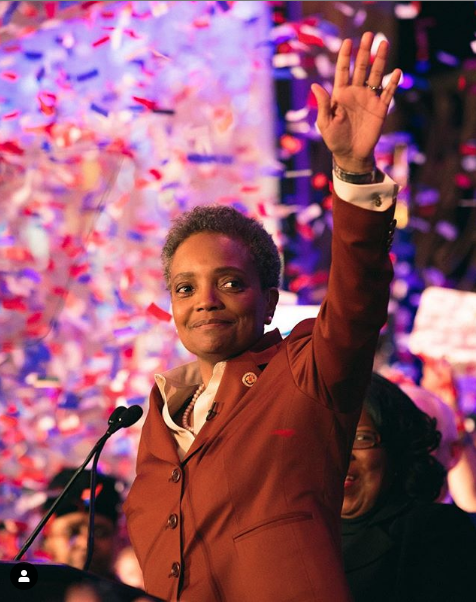 Chicago mayor-elect Lori Lightfoot celebrates her victory on April 2. Columbia Chronicle photo by Steven Nunez, Scholastic Press Association of Chicago 2018 student journalist of the year/ Steinmetz alumnus. Instagram: stevensjpeg Sharkey said that $100,000 was a “pass through” from the IFT and much of the CTU’s donation was “in-kind” — office space and phones for phone banking and so on. He stressed that no dues money was used for any donation. All donations are from voluntary contributions made by members into the political action fund. The delegate from McCucheon School said that all special education teachers have been scheduled to conduct back-to-back IEP meetings on report card pick up day. Sharkey was unsure if this is a contract violation but the school’s Professional Problems Committee should work on it as it is foolish to not have teachers available to meet with parents. Delegate Maldonado used her time at the microphone to urge everyone who can to attend a rally protesting the expected approval of the Lincoln Yards project. The $1.3 billion in TIF money that would be given to the developers reduces the amount of tax revenue that goes to the Chicago public schools. The rally will be on Tuesday, April 9, at 4:30 p.m. at 121 N. LaSalle. All are urged to contact their aldermen and urge them to vote “No” on the Lincoln Yards project. Erica Wozniak asked about the status of the repeal of the 4.5 Amendatory Act in the General Assembly which “puts a brick” on the CTU’s ability to negotiate a contract. Sharkey said the bill has passed the House and Gov. Pritzker has said he will sign it. It is in the senate now so pressure needs to go on our state senators to get them to vote on it. He also specifically referred to former delegate Jerry Adler for his consistent stance on arguing to get that onerous bill repealed. Karen Soto of Waters elementary school complained about classrooms being too hot or cold and that it takes hours for a roving engineer to show up to adjust things. Sharkey said the delegates in schools need to file “health and safety” grievances under Article 14 to build a record of problems that can be used to force CPS into putting an engineer in every school. Victor Ochoa of Schurz High School said that as it appears that we are facing a strike in the fall, and asked what is our planned budget for a strike and asked what kind of “checks and balances” that will be available to keep track of the funds. Sharkey said that the upcoming budget will be presented to the House in May and approved in June and it is the House that is a “check” on spending. He said that the 2012 strike cost about $1 million. Retiree delegate Pat Jones asked why the CTU disrespects retirees. Specifically, she said that in the past retiree substitutes were paid $200 a day but they are getting about $160 a day now. Sharkey disputed that. He said cadre subs may have gotten the $200 figure Jones cited but not so for day-to-day subs. Retirees generally cannot be cadre subs because they are limited by state law to subbing only 100 days for CPS in a school year and many cadre sub positions last longer than that which is allowed. The pre-meeting Q and A, which had begun at 4:15 p.m. ended and the regular meeting began at 4:50. Washington High School delegate Frank McDonald tried to suspend the rules for a motion requiring the CTU to oppose any merger of the Teachers Retirement System (TRS) and the Chicago Teachers Pension Fund (CTPF). Sharkey ruled him out of order and the House upheld his ruling on appeal from McDonald. Brunson stressed the importance of supporting the April 9 rally against the Lincoln Yards project. Brunson also yielded the microphone to Joseph Dunlop, who is one of the CTU Six. These are members who resisted CPS’ illegal procedures and policies and faced harassment, disciplinary actions and even termination for their outspokenness. They recently won complete vindication in an arbitration suit. Besides Dunlop, they include Sarah Chambers, Laura Sierra, Kevin Triplett, Jose Contreras and Jesse Hudson. Catalano presented a graph that shows that salaries and a few other items are slightly over budget for this year so far. She said that in the budget it was expected that there would be a reduction in force in the CTU office but that has not occurred to the extent estimated. Moreno presented a potential list of candidates for the upcoming CTU elections in May. (NOTE: I will be on the ballot for Illinois Federation of Teachers (IFT)/American Federation of Teachers (AFT) delegate). The final list will be approved at the May meeting. Moreno said that in response to suggestions from a volunteer committee of delegates, proposed resolutions will be posted on the CTU Members Portal so delegates can get input from members before they vote on any resolutions. Davis Gates said that voluntary participation in the CTU Political Action Contribution is at its highest in eight years. She then went through a litany of CTU political successes in getting people elected, passing bills, (e.g., the pension levy), stopping the growth of charters and successful charter strikes. She said that the CTU prepared two letters of congratulations before the mayoral election. Both were identical and she said that no matter who won, we have to understand that the mayor is our boss. She said she is concerned because reports have Lightfoot’s transition team including Arne Duncan and Ty Faynor, a Republican who tried to gut our pensions a few years ago. Sharkey said that even though the polls showed Preckwinkle far behind Lightfoot in March, the CTU still officially supported her but “pivoted” in our support to deal with issues that would concomitantly help various aldermanic candidates that we backed. He is concerned that too many of Lightfoot’s supporters are billionaires who are eying tax dollars a la Lincoln Yards that we feel should be going to the schools instead. Sharkey said the CTU has been looking at the CPS summary budget for next year. He said that the budgets for the school are being based on this past October’s student enrollment and not on projected September enrollment. This will mean that some schools will have reduced budgets and that will affect positions. He asked CPS officials as to whether layoff notices will be issued before notices of vacancies for new hires at other schools go out. Jesse assumes the negative since they wouldn’t give him a straight answer. A. Resolution for Support of Private Detention Facility Moratorium Act HB 2040. The federal government bought land near Dwight, Illinois, and is planning to build a prison to be run by a private corporation. The purpose of the prison is hold immigrants coming into the U.S. whether they were seeking asylum of entering illegally. She urged delegates to take leaflets and get them to parents to rally against the transfer of TIF to Lincoln Yards from the schools where the money should really be spent. Norine also gave Cassandra Tsitsopoulos of Prosser more time to ask for support to save the auto shop at her school. Lisa stressed that this coming Friday is a full teacher self-directed day and to make sure the principals don’t try to usurp teachers’ time. A grievance filed against the use of the Khronos system is going to arbitration. Khronos requires teachers to properly sign in and out themselves everyday and it is difficult to correct errors. Also, teachers are doing the work of payroll clerks and that is not part of their job description. The Comprehensive Annual Financial Report of the CTPF for 2018 has just been released. Members can access it on-line. If you give the CTPF your e-mail address, they do not share it with any other individual or organization. Contact them to get the newsletter. There were pros and cons expressed about the CPS rolling out a new system of recording student data known as IMPACT. It is scheduled to start the 4th quarter and Natasha Carlson thinks it will be a disaster. Another delegate maintained that it is better to have and test it now instead of having it screwing up at the start of the school year in the fall. A delegate asked what criteria is used to determine how much money the CTU PAC gives to candidates. Davis Gates said that there is no set formula; that there are different aspects of a campaign that are evaluated and used to determine contributions. After being asked, Sharkey said that candidates for CTU offices will have a forum to present their views at the May House meeting. Hoyne School’s security guard has not cleared his background check and they have no security person for now. Sharkey said to definitely file an Article 14 grievance to force the Board to fill that position. Washington High delegate McDonald tried to make a motion that would have the CTU oppose a merger of the TRS and the CTPF. Jesse said that that it is not needed as the CTU would never go along with that. Stacy said that she would like to have PSRPs removed from the City Municipal Pension Fund and placed in the CTPF but that would negatively impact the Muni Fund. Retiree delegate Tom Lalagos asked if TAs (Teaching Assistants) and SECAs (Special Ed Classroom Assistant) are interchangeable. Sharkey said no but many principals do it anyway. It is necessary to document these instances so delegates are asked to file grievances on it. The CTU may be able to file an unfair labor practice if they have documentation. Unlike teachers, PSRPs who retire cannot work for the CPS as subs without jeopardizing their pensions. The last question was if a school’s budget is reduced and staff has to be cut, does the principal have to follow seniority. Sharkey said yes, but other factors are considered such as teacher ratings and degrees attained. Much thanks to George Milkowski for this succinct reporting of the April HOD meeting. I'd just like to add that the first speaker was Diane Blaszczyk, long-time delegate from Onahan School, and known to most old-timers. Most other speakers are named in the story. Near the end of the story, Impact is misidentified as the "new" Student Information System. Actually, Impact is the current IS, having been in place for more than a decade, and will be replaced by ASPEN on April 22.